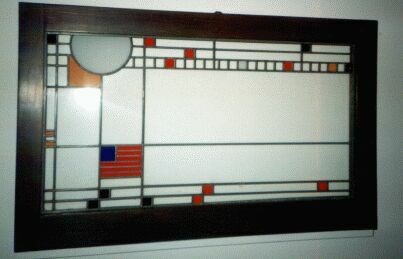 Welcome to the FRANK LLOYD WRIGHT Picture Page. As a long time fan or Mr. Wright's works and words it is a pleasure to present this web site in his honor. It must be said that no picture(s) can adequately capture the majesty of personally visiting Wright Sites. Hopefully you'll get as much enjoyment as possible from your Cyber Visit...and ultimately be encouraged to support preservation of Wright's work in the future. This Frank Lloyd Wright designed stained glass window was snapped at the High Museum of Art in Atlanta, Georgia. It was not known that flash photography is not permitted in the museum; although museum officials promptly provided notification. and You Can Use Any of This Site's Pictures in Your Web Page(s).